Each female on this jiu jitsu journey will have their own personal “firsts” that feel life changing. Your first class, your first stripe, your first competition, your first belt promotion are all major milestones. Professor Gina Franssen’s big milestone, promotion to black belt, also made her Minnesota’s first female Brazilian Jiu-Jitsu Black Belt. 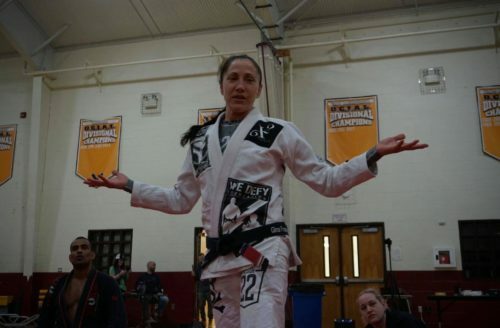 Gina Franssen, Black Belt 1st Degree under Prof Chris McCune – Rigan Machado Association is also a board member for the We Defy Foundation and owner and head Instructor of X2 Fitness in Minneapolis, MN. We Defy Foundation is a non-profit organization that helps disabled combat Veterans suffering from life-disabling injuries and/or PTSD through physical fitness and jiu jitsu. Gina has been a driving force for creating safe and welcoming spaces for all to train, and working with the We Defy Foundation she continues to give her heart and soul to her students. 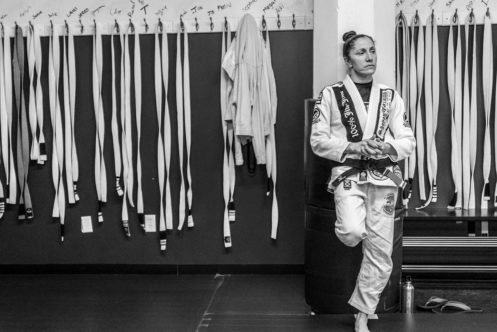 As jiu jitsu continues to be an outlet for all kinds of people, there is also a noticeable growth in the female community. At almost any academy and gym, you can find some type of womens’ class, self defense or other. The representation of women goes beyond classes, though, and Gina has taken notice. When asked where she sees herself and her gym in five years, Gina sees another expansion, more growth in her team and seminars.